After years of serving as an aide to the local councilman, Vivian Moreno is now working to help lead San Diego and hopes to be the first woman elected to the City Council’s Eighth District. Moreno came in first place in June’s Primary Election, garnering more votes than her two opponents. Moreno, a native of South San Diego, has been closely involved with some of the area’s major successes during the past eight years. “I’m so excited about the projects we have been able to complete in our communities, like the first new park in the South Bay in decades, building the new library in San Ysidro, repaving thousands of miles of streets, and bringing the long-awaited Chicano Park Museum to Barrio Logan,” Moreno said during a recent interview at La Prensa’s offices. As a top aide to Councilman David Alvarez for the past eight years, Moreno has worked closely with community leaders and residents on issues ranging from street repairs to graffiti removal and dealing with homelessness near downtown. The Eighth Council District includes the communities of Barrio Logan, Logan Heights, Sherman Heights, Nestor, Ocean View Hills, Otay Mesa, San Ysidro, and the Tijuana River Valley. 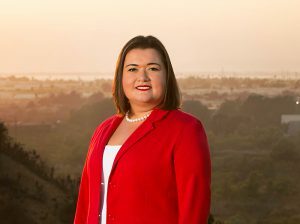 Before joining Alvarez’s office staff, Moreno worked for a metal distribution company in South San Diego, giving her hands-on experience in what it takes to maintain and grow a local business in the District. Having first applied to be a receptionist right after graduating from college, Moreno impressed the company owner during her interview and was instead offered a position as a metal buyer, working to source raw materials from various vendors. Moreno currently serves on local non-profit organization boards, including the Borderview YMCA branch in Otay and MANA of San Diego. For the past seven years, Moreno has served as a one-on-one mentor to girls between the ages of 12-18 through the Hermanita program geared to help young women attain higher education and career advancement. A graduate of UC San Diego, Moreno knows first-hand the advantage a college education gives students, especially those from underserved communities. This year, Moreno launched her campaign for the City Council after meeting with community leaders and residents that want to see more improvements around their neighborhoods. Moreno understands the many services the City provides, as well as the complex infrastructure improvements needed to fix streets, roads, sidewalks, and water pipes throughout the City. Moreno has experience with the City’s $3.6 billion annual budget and over 11,500 employees. “I believe my experience will allow me to hit the ground running on Day One, and help bring new leadership to City Hall,” Moreno said. “I’ve worked tirelessly for the past eight years to address the needs of the residents of District Eight, and I hope I will have the opportunity to serve all of San Diego on the City Council” she added.